Announced the launch, through its new subsidiary, TradeStation Forex, Inc., a CFTC-registered, NFA-member Retail Foreign Exchange Dealer (RFED), of a brand-new, state-of-the-art retail forex offering. Starting today, TradeStation Forex, using what is commonly referred to as the "agency broker model" for retail forex, will own and operate the company's forex business for all existing and new customer accounts. We believe our combination of features and pricing produces a powerful offering that is superior to what is available in the market today for retail forex traders. We think TradeStation can now become a dominant brand in the retail forex market, just like it has been in the online equities and futures markets over the past ten years, and we plan to devote dedicated marketing dollars and focus to this launch and to grow market share as quickly as reasonably possible. A brand-new screen interface for traders to place forex orders in an intuitive and familiar way, which is seamlessly integrated with the full analytics power of the TradeStation platform. The ability to design, back-test, optimize and automate custom-designed and third-party forex trading strategies and ideas. The functionality of TradeStation's premium RadarScreen® product (TradeStation's state-of-the-art market scanning engine), so that customers can analyze multiple foreign currency pairs simultaneously on one screen. A forex market depth window. Transparent foreign currency spreads which, including TradeStation's small mark-up, are expected to be extremely tight and competitive – superior, the company believes, to what is generally available today in the market. If you're currently a MetaTrader user there's any amount of things in that screenshot that are not very familiar, and probably not very intuitive either. On the left is a "Market Depth" window, incorporating the new "Quick Trade Bar" which might seem vaguely familiar at least. 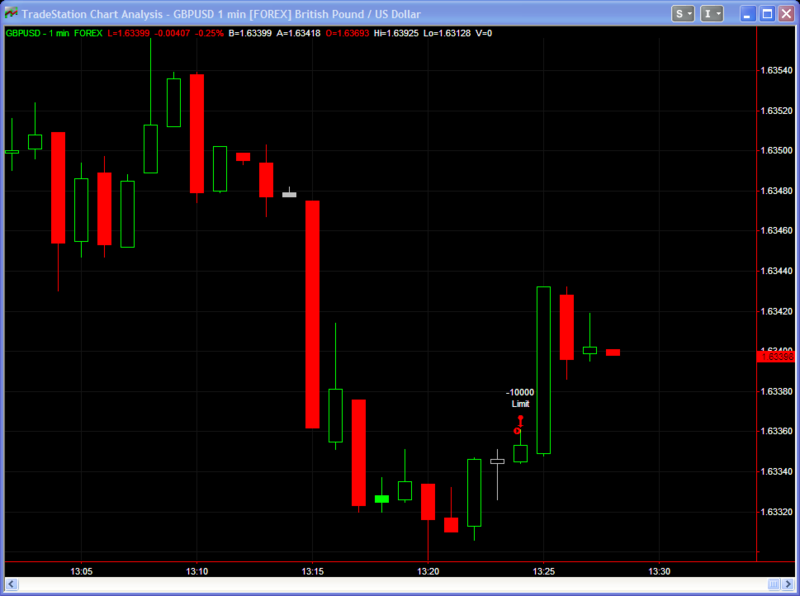 Notice that I entered the trade using the "shave" option to place a limit order inside the spread. On the right is a "Matrix" window, showing a different view of market depth plus any open or pending orders close to the current market price. Moving on to automated trading, whilst TradeStation 9.0 may provide you with the ability to "use custom-designed and third-party forex trading strategies and ideas", any such strategies will need to be written in TradeStation's own "EasyLanguage". TradeStation Forex don't support third-party platforms (like MetaTrader), and they don't provide an API that would allow custom software of the sort we produce here at the Trading Gurus to use TradeStation Forex for executing trades. 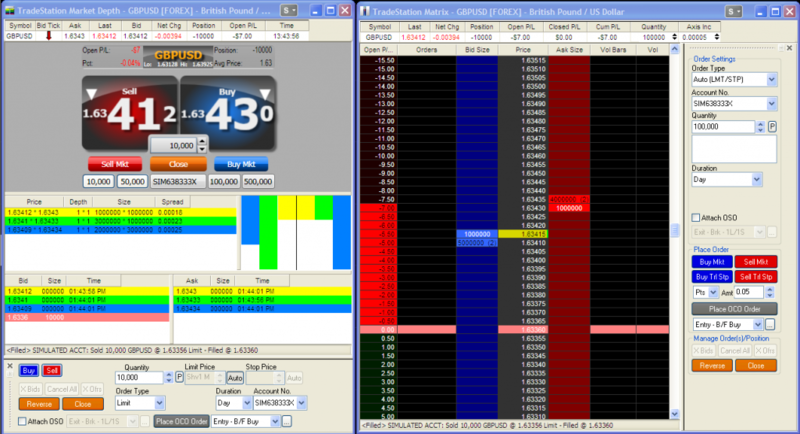 Even if TradeStation are correct in their expectation that their spreads will prove to be "superior to what is generally available today in the market", I can't help thinking that forcing automated forex system vendors to port their trading strategies to a new platform and a new programming language will prove to be a major obstacle in the way of TradeStation "becom[ing] a dominant brand in the retail forex market". That's obviously a very simple example, and you can of course do much more elaborate things with TradeStation 9.0, especially if you don't mind programming in EasyLanguage. The question is how many forex traders and software vendors who can't currently do so will be tempted to learn how. Easy language or not, that is the question? Does it Pay You to Trade Forex with MB Trading?